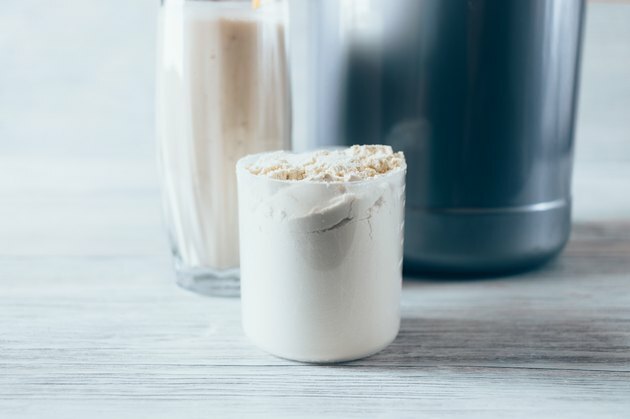 How Often Should You Drink Whey Protein Per Week? Whey protein powder has emerged as one of the most popular sports supplements worldwide. From weekend warriors and athletes to dieters, everyone praises its benefits. Some use whey protein for muscle gain. Others rely on it to keep hunger at bay and lose weight. When combined with exercise, this supplement can help you get stronger, leaner and more fit. How much protein powder you need depends on your goals. Whey protein powder is a healthy addition to most diets. How often you take this supplement should depend on your age, fitness goals and activity level. Protein requirements vary greatly from one individual to another. Health experts typically recommend a daily intake of 0.8 grams of protein per pound of body weight. According to Harvard Medical School, this is just the minimum amount needed for a healthy person. The more active you are, the higher your protein intake should be. Furthermore, protein requirements increase with age. As Today's Dietician states, older people require this nutrient in larger amounts to prevent muscle loss and maintain lean mass. Nutritionists advise seniors over age 65 to consume at least 1 gram of protein per kilogram of body weight daily. Athletes and physically active individuals need more protein in their diet too. This nutrient helps preserve muscle, increases overall strength and supports post-workout recovery. It also helps dieters prevent muscle loss. It's not uncommon for athletes to consume 2 or more grams of protein per kilogram of body weight on a daily basis. So, there's no one-size-fits-all formula to determine protein intake. It all comes down to your goals and fitness goals. Whey protein powder can make it easier to meet those goals and get the most out of your workout. You can choose to take this supplement daily or every few days. For example, if you're on a low-calorie or low-carb diet, it makes sense to increase your protein intake. Whether it comes from food or protein powder shakes, this nutrient will keep you full longer and boost your metabolic rate. Is Whey Protein Powder Healthy? The health benefits of whey protein powder are backed up by science. When combined with exercise, this supplement may help increase muscle size and strength, reduce body fat and improve body composition. That's why nutritionists recommend whey protein for weight loss. Protein powder drinks, especially those containing whey, suppress appetite and cravings while increasing satiety. In fact, whey is more effective for appetite control than soy, casein and egg protein. Additionally, it helps reduce blood sugar levels and slows gastric emptying, preventing insulin spikes. This means that whey protein powder isn’t just safe but also beneficial for diabetics. If you're feeling tired and sluggish, look no further. Protein powder drinks can boost your energy levels and physical performance due to their high content of amino acids. These compounds also improve immune function and reduce exercise-induced oxidative stress. According to a study published in Sports Medicine, the best time to take whey protein for muscle gain is after your daily training sessions. This way, you'll recover faster from exercise and prevent muscle soreness. For general health, feel free to consume protein powder drinks anytime throughout the day. These supplements can replace your daily snacks and keep you full between meals. Choose a quality formula with no added sugar and other chemicals. Organic whey protein powder, whey isolate and hydrolyzed whey protein are all an excellent choice. Check the label and nutritional values. Whey protein concentrate, for example, has 2 to 3 grams of carbs per serving — and even more. Whey protein isolate, on the other hand, contains little or no carbs. World Journal of Diabetes: Whey Protein: The “Whey” Forward for Treatment of Type 2 Diabetes?